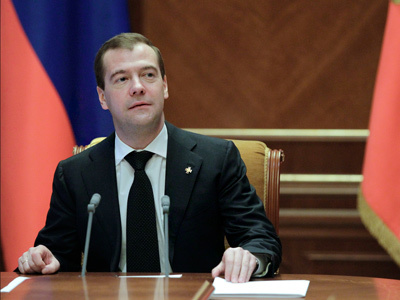 President Dmitry Medvedev has said that he sees no preconditions for a revolution in Russia. He also noted that he is not ready to leave politics yet, and might run for the presidency again in the future. “I would very much dislike events in our country to develop according to a revolutionary or other extreme scenario,” Medvedev said at a meeting with Moscow State University (MSU) journalism students. “But, frankly speaking, I don’t see sufficient preconditions for that,” he added. 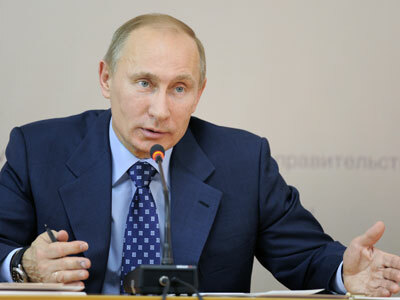 The president said that his attitude to the current political situation is more balanced, thanks to his life experience. 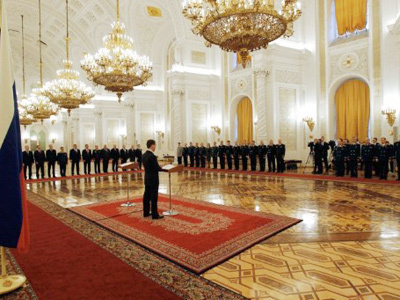 Medvedev recalled the dramatic events of the early nineties. “Today there is some disorder, too. Perhaps, in that sense I can’t be entirely happy with what I’ve done in the past four years,” he confessed. 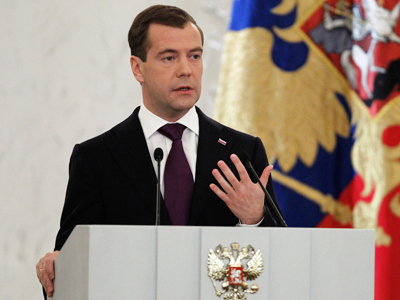 “But I am confident that our country doesn’t need any revolutions,” Medvedev underlined. Answering a student’s question on whether Medvedev would be ready to appear before a people’s court, the president said that he is not afraid of anything. “…Otherwise, I wouldn’t be able to serve as president,” he added. 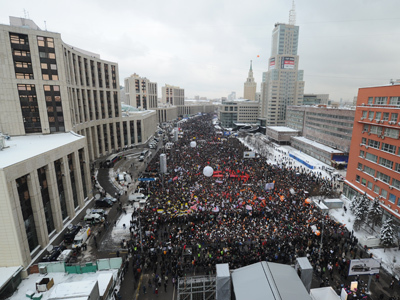 Speaking about the recent mass protest rallies that swept through Moscow and other cities following the December 4 Duma election, Medvedev admitted that some of his supporters might have been among the protesters unhappy with the “tandem’s” decision concerning the March 4 presidential poll. On September 24, at a convention of the United Russia party, Medvedev announced that he supported Vladimir Putin’s candidacy for the forthcoming presidential election. 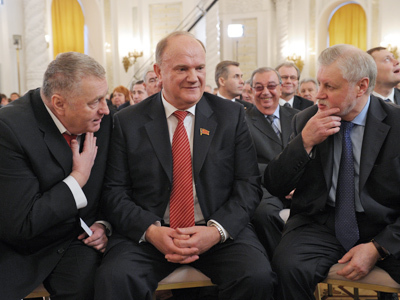 On November 27, a second party convention endorsed Putin’s nomination. Talking to young journalists on Wednesday, Medvedev said that even though he would not “link this directly” to his refusal to run for president, some protesters perhaps wanted the scenario to develop in a different way, and would rather see him taking part in the upcoming election. “But this time I really decided not to run for reasons of political suitability, because I thought that two people representing the same political force must not elbow each other. The one who currently perhaps has slightly more chances of winning should go ahead,” Medvedev said. 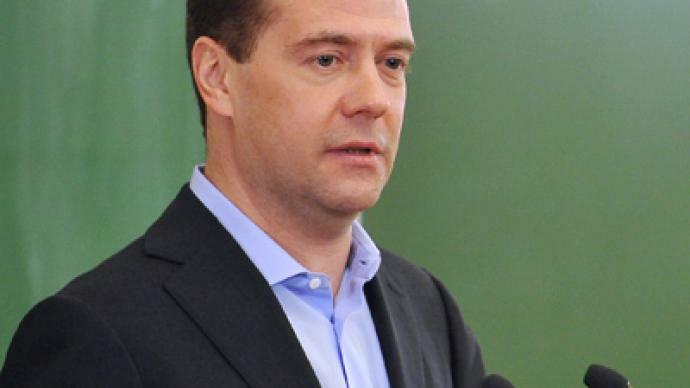 However, Medvedev does not plan to leave politics yet. “I’ve never said that I will never run again. Let me remind you, I’m only 46 – which isn’t such a serious age as to refrain from further political battles,” he observed. The president also expressed his views on the recent parliamentary vote. “I have experience of observing elections since 1991. No matter how much criticism these elections received – and there certainly were violations, some of them outrageous perhaps – these were the cleanest elections in our history,” Medvedev told the students. At the same time, he said that “we should work together on improving the electoral system,” so that votes would give rise to fewer questions. The president pointed out that there have always been, and will be election violations and attempts to falsify the results. “But we should ensure that everything is under public control,” he said. Medvedev also touched on Moscow-Washington relations, saying they have not got worse, just as his relations with American President Barack Obama have not deteriorated. He expressed hope that the new US Ambassador to Russia Michael McFaul will take into account the country’s specific framework and act within his mandate. “Preliminary, my colleague Barack Obama informally came to agreement with me over this figure,” Medvedev said. The president added that he knows McFaul personally and feels he is “a sensible” person. However, the Russian leader did not rule out that tensions between the two powers over the American missile defense system in Europe may worsen in the late 2010s.Medvedev admitted that Russia and the US have serious differences on the planned defense shield. Censorship in the media was also discussed at the meeting on Wednesday. According to the president, this problem exists due to the large number of state media outlets in Russia. “In some cases, the state…’polishes’ the situation [in the media]. This refers to both federal and regional media,” he said. 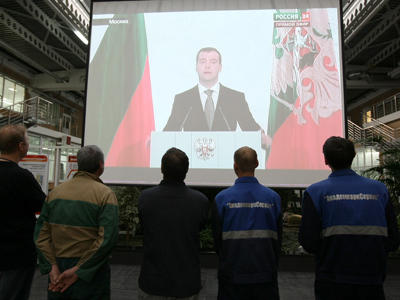 As a possible solution, Medvedev suggests creating a public TV station. What has to be decided now is, what independent source could finance it. The president’s meeting with students lasted for 2.5 hours, during which he answered several dozen questions from future wordsmiths.